Householders across Cornwall are being encouraged to join forces to cut their energy bills through a new initiative called Community Energy Switch. The collective switching service has been launched by the Cornwall-based charity Community Energy Plus, which provides services to help householders reduce their energy use and ensure that they can afford to heat their homes. The charity is working with the national switching organisation energyhelpline to co-ordinate their collective switch and link into the group buying power of several other collectives taking place across the country at the same time. Householders have until 1st March to register, after which UK energy suppliers will compete to offer the cheapest exclusive tariffs. Community Energy Plus is confident that with average savings of £221 a year, based on energyhelpline’s last collective switch, bill payers will snap up the opportunity to switch to a better deal. Registration is free, quick and simple with no obligation to switch. Register online at www.communityenergyswitch.org.uk or call Freephone 0800 804 7247. For many people living in Cornwall, household incomes have failed to keep up with rising energy and living costs. Community Energy Plus has seen a steady increase in the number of people contacting them because they are struggling to keep warm and pay their energy bills. The initiative is being endorsed and promoted by Cornwall Council, NHS Kernow and the Winter Wellbeing Programme for Cornwall and the Isles of Scilly. Householders who register their details will be contacted with details of the winning energy deal from 2nd March. As well as being offered the exclusive winning tariff they will also see all other tariffs in the market, so if another tariff suits an individual’s energy needs more, they can sign up for that instead; there will also be green tariffs on offer. Once a householder has agreed to switch, the necessary arrangements will be made on their behalf with their old and new suppliers. Switching is a seamless process – there isn’t a physical change to the energy supply but householders can feel the financial benefit of getting a better deal on your energy bills. Community Energy Plus runs an oil buying club with over 2,000 members and was previously a lead partner in Cornwall Together alongside Cornwall Council, NHS Cornwall and The Eden Project which carried out two collective switches in 2012 and 2013. 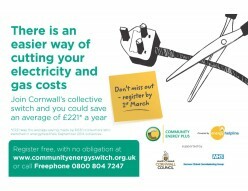 The charity’s Community Energy Switch initiative seeks to build on the achievements of Community Energy Club and Cornwall Together and help many more householders to save money on their energy bills.